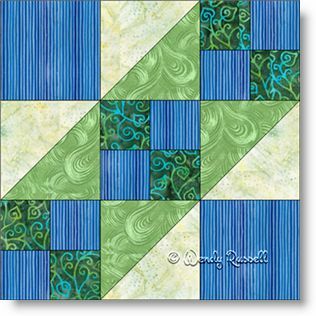 The Jacob's Ladder quilt block fits into the easy category of quilt blocks because it contains only two shapes -- the square and half square triangle patches. It could also be considered an intermediate block due to the number of pieces in the pattern. It is a nine patch block, which is one of the most commonly used quilt block styles. The sample quilts illustrate the use of four quilt blocks to make a single, larger quilt block. This allows for rotation of the individual four blocks to create a secondary pattern.